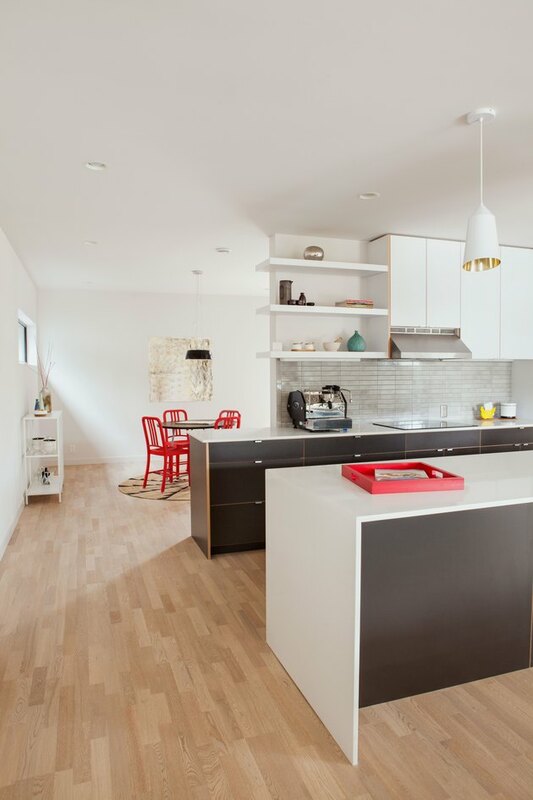 In Seattle, a Home so Energy-Efficient, It's "Passive House Certified"
When a 69-year-old retiree decided to build a new home in a neighborhood north of Seattle, he wanted a place that was reminded him of his past but with features that looked toward the future. 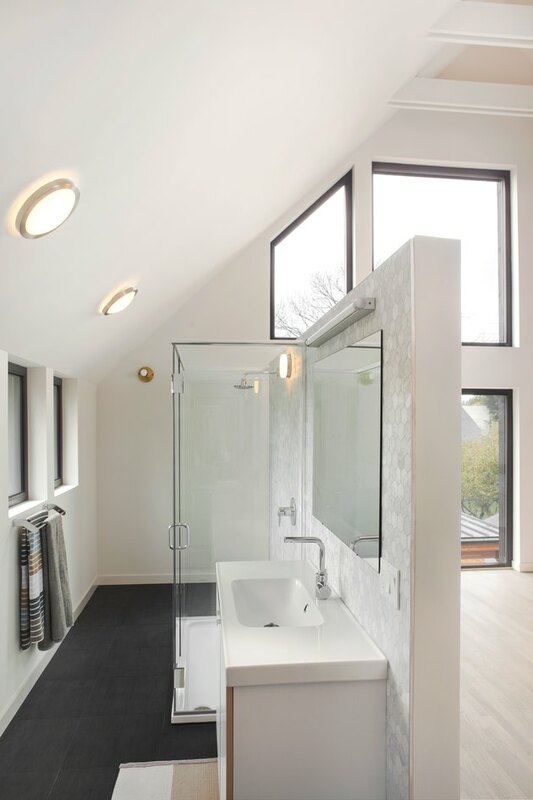 Architects Tiffany Bowie and Joe Malboeuf of Malboeuf Bowie Architecture worked with the owner to design a home that met passive house certification standards, a complex process that ensures extreme energy efficiency. Inspired by Scandinavian design, the architects focused on incorporating simple forms and plenty of open spaces. 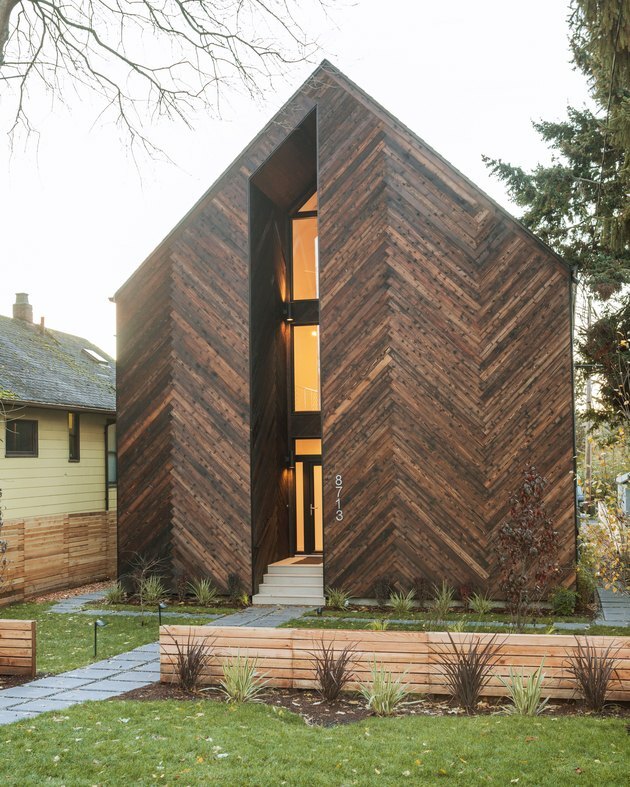 The façade is clad in hand-charred cedar in a herringbone pattern. The wood's shou sugi ban treatment is a nod to the owner's travels and work in Japan and also helps protect the material from the rainy climate. One of the major challenges the architects faced was bringing in natural light, without impacting the energy efficiency of the house. They used carefully placed, triple-glazed windows to brighten the space while maintaining privacy. They also added smart home technology by Kirino to optimize the house's heating and ventilation systems and minimize energy waste. 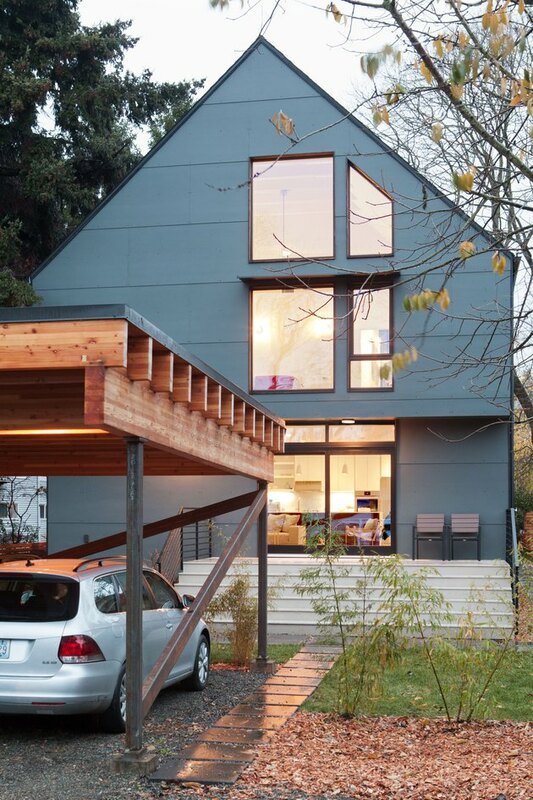 With its passive house features and striking design, this is a home that enhances the environment in more ways than one. The architects played with the form of a traditional gable roof house and devised an exterior that is largely windowless. 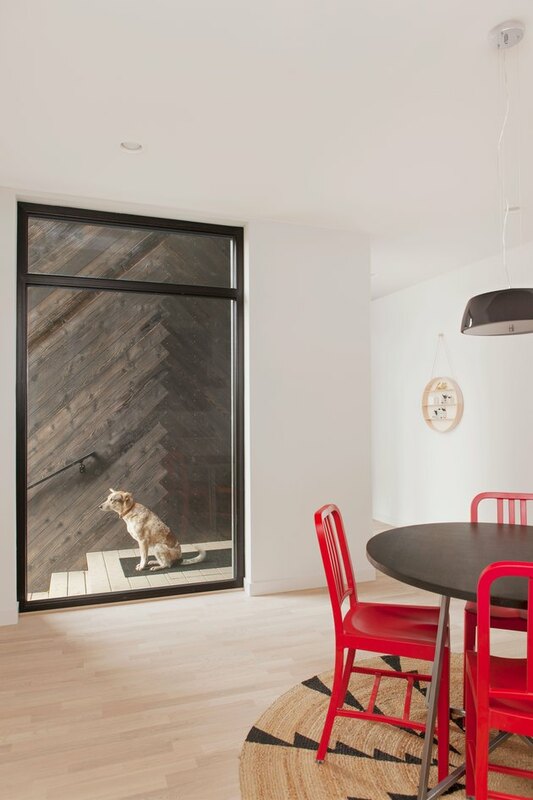 The cedar cladding was hand charred and installed in a herringbone pattern. In the dining room, red Emeco 111 Navy Chair from Design Within Reach surround a CB2 table and energize the minimalist space. The kitchen has a mix of open shelving, which displays ceramics, and laminate cabinets. The white quartz counters and the Japanese-glazed tile backsplash from Design and Direct Source keep the space feeling bright. 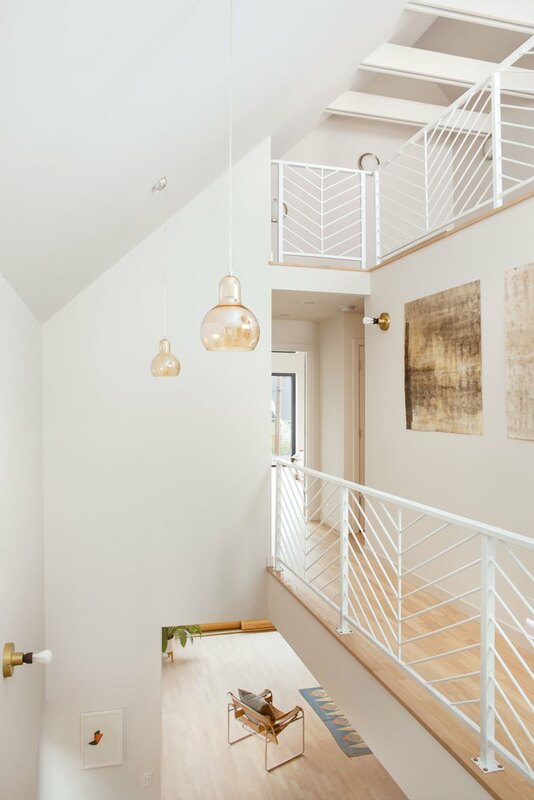 The custom powder-coated steel railing echoes the herringbone-patterned exterior. Sofie Refer Bulb lights illuminate the staircase. 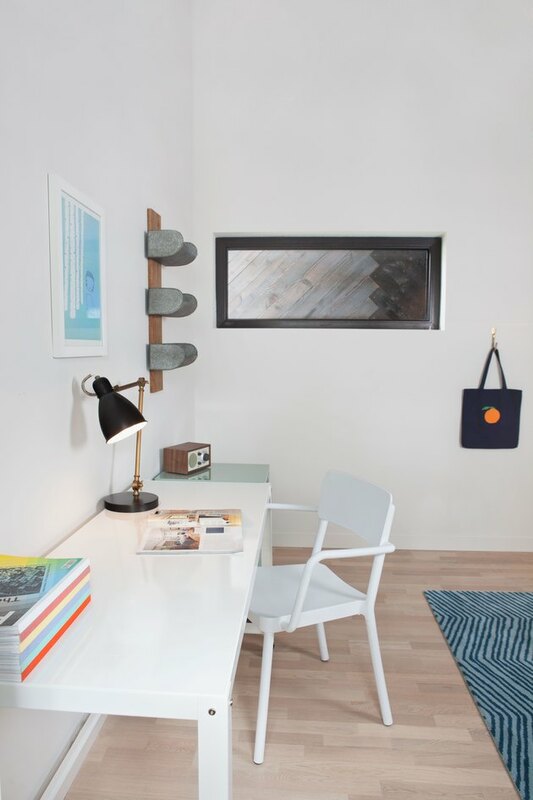 In a bedroom/study, a CB2 table and Lisboa Chair from Design Within Reach create a crisp white workstation, complete with a West Elm lamp and Tivoli radio. 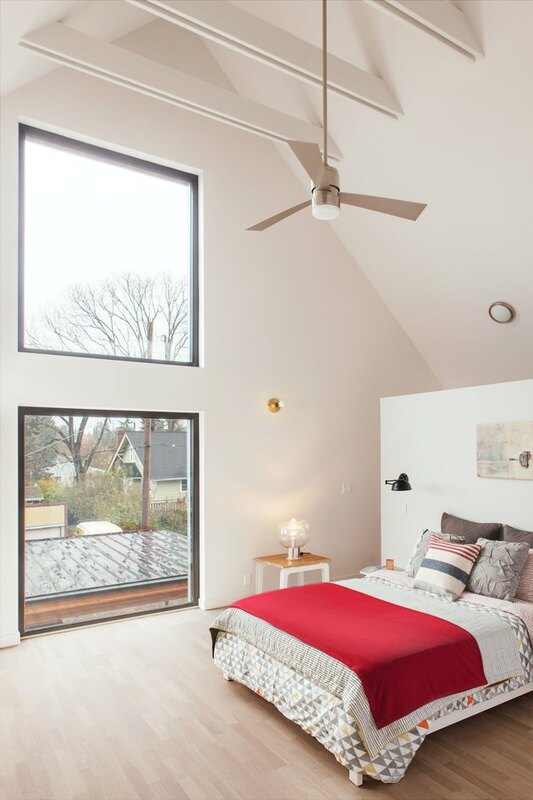 The master bedroom's soaring ceilings and large windows add to the bright and airy feel of the room. Bowie designed and built the wood side table, while Malboeuf created the encaustic art above the bed. Black porcelain tile by Statements Tile covers the floor of the master bathroom, while marble hexagonal tile sheathes one of the walls. The vanity includes an Ikea sink with a Hansgrohe faucet. The architects designed a carport out of steel, glulam beams, and a standing seam metal roof. The rear exterior is clad in prefinished fiber cement panels.